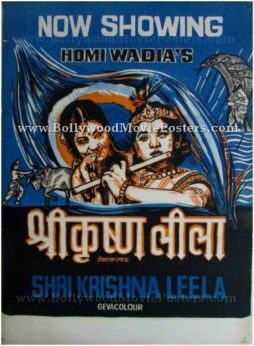 Vintage Hindu mythology poster for sale of the old Bollywood movie, Shri Krishna Leela (1971). This is an actual surviving old Bollywood poster for sale of the 1971 Hindu mythology film that was produced and directed by Homi Wadia. The film was released under Homi Wadia's Basant Pictures banner. This Hindu mythology poster was originally designed and printed for publicity of the film somewhere in the 1970s but never ended up being used. Shri Krishna Leela was a Hindu mythology film that chronicled the story of Lord Krishna. This Hindu mythology poster was originally hand drawn on canvas by a small time art studio in Kolkata giving it a very quirky appearance. Lord Krishna is seen prominently in this Hindu mythology poster in the center. A vibrant blue background is seen in this old Bollywood poster for sale giving it a very catchy appearance. The combination of light orange against a blue background sets an interesting contrast in this Hindu mythology poster. 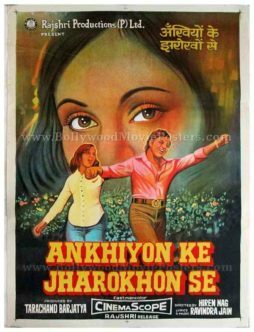 Old, quirky handmade Bollywood poster of the hit Hindi movie, Ankhiyon Ke Jharokhon Se (1978) for sale. This is an actual surviving handmade poster of the 1978 Hindi movie that featured lead actors Sachin and Ranjeeta Kaur in a romantic plot. Printed and circulated a few years after the first release of the film (early 1980s), this old handmade Bollywood poster was originally designed for publicity of the film but never ended up being used. The poster features a quirky painting of the lead couple in a romantic dancing pose in the foreground. A large hand painted semi portrait of the lead actress is seen in the background with a focus on her eyes. 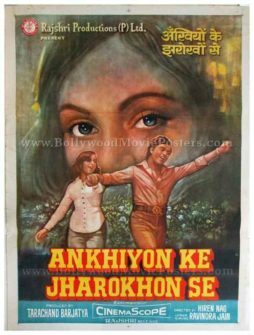 Ankhiyon Ke Jharokhon Se is a 1978 Hindi film starring Sachin and Ranjeeta Kaur in lead roles. Owing to the critical success of the film, in 2011 a sequel called Jaana Pehchana was released. Old, quirky hand painted Bollywood movie poster of the hit Hindi film, Ankhiyon Ke Jharokhon Se (1978) for sale. This is an actual surviving vintage movie poster of the 1978 Hindi film that featured lead actors Sachin and Ranjeeta Kaur in a romantic plot. Printed and circulated a few years after the first release of the film (early 1980s), this old hand painted Bollywood movie poster was originally designed for publicity of the film but never ended up being used. 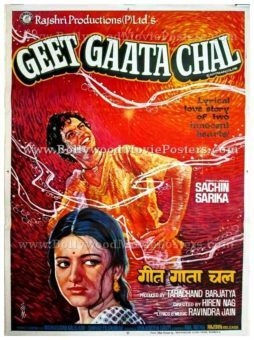 Beautiful hand painted old Indian movie poster of Geet Gaata Chal (1975) for sale. This is an actual surviving old movie poster of the 1975 romantic hit that featured Sachin and Sarika in lead roles. Very few old Indian movie posters were designed in a horizontal/landscape format, making this poster incredibly rare and highly collectible! Printed and circulated during the first release of the film (somewhere in the mid 1970s), this old hand painted Indian movie poster was originally designed for publicity of the film but never ended up being used. This poster was originally designed on a hand drawn canvas by one of the most sought after Hindi film poster artists/painters, C. Mohan, making it highly collectible. The poster bears the signature style of C. Mohan’s mastery, with superbly hand drawn portraits of the lead actors. Artist C. Mohan’s original signature appears on the bottom right of the poster. The typography used in this poster is entirely in Devanagari Hindi, except for a translation of the title in English on the top right hand corner. A fantastic large portrait of the lead actor playing a flute is seen on the center of this vintage movie poster. He appears serenading his lady love who is depicted on the right hand corner in a somewhat shy pose. Musical waves and notes are seen traveling from the flute into the background. The lead actor is seen wearing a chain around his neck, which seems almost as if sketched with a pen. Geet Gaata Chal (Keep singing this song) is a 1975 hit Hindi film starring Sachin, Sarika, Madan Puri, Padma Khanna and Leela Mishra. 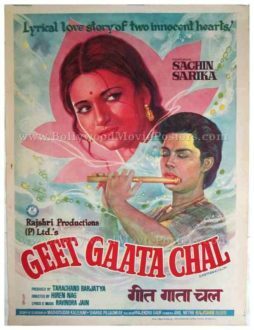 Geet Gaata Chal was a big success for its lead actors as well as music director Ravindra Jain, who composed memorable songs for the film. Beautiful hand painted old Hindi film poster of the hit Bollywood movie, Geet Gaata Chal (1975) for sale. This is an actual surviving vintage Hindi film poster of the 1975 romantic hit that featured Sachin and Sarika in lead roles. Printed and circulated during the first release of the film (somewhere in the mid 1970s), this old Hindi film poster was originally designed for publicity of the film but never ended up being used. This poster was originally designed on a hand painted canvas by one of the most sought after Bollywood poster artists/painters, C. Mohan, making it highly collectible. The poster bears the signature style of C. Mohan’s artistic capabilities, with superbly hand painted portraits of the lead actors. Artist C. Mohan’s original signature appears on the bottom left of the poster. The typography used in this poster is entirely in English, except for a translation of the title in Devanagari Hindi at the bottom. The lead actor is seen playing a flute at the bottom, serenading his lady love who appears on the top encased in a lotus shaped flower. 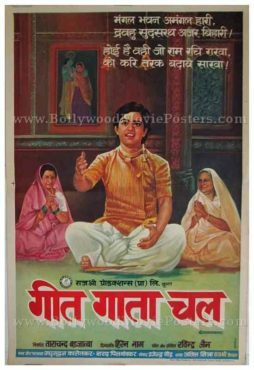 Musical waves and notes are seen traveling from the flute into the background of this old Hindi film poster. 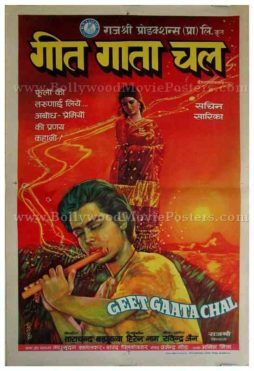 Beautiful old handmade Bollywood movie poster of the hit Hindi film, Geet Gaata Chal (1975) for sale. This is an actual surviving vintage Bollywood movie poster of the 1975 romantic film that featured Sachin and Sarika in lead roles. Printed and circulated during the first release of the film (somewhere in the mid 1970s), this vintage Bollywood movie poster was originally designed for publicity of the film but never ended up being used. This handmade Bollywood poster was originally designed on canvas by one of the most sought after Bollywood poster artists/painters, C. Mohan, making it highly collectible. The poster bears the tell-tale marks of C. Mohan’s artistic talent, with superbly drawn portraits of characters. Artist C. Mohan’s original signature appears on the bottom right of the poster. The typography used in this poster is entirely in Devanagari Hindi. The lead actor is seen singing a song in a courtyard, flanked by two older women who have their hands locked in a prayer pose. A beautiful painting of Lord Krishna with Radha is seen in the background. The top of this handmade Bollywood poster features a few lines from a poem/song sung in the film. Beautiful hand painted old Bollywood poster of the hit Hindi film, Geet Gaata Chal (1975) for sale. This is an actual surviving vintage Bollywood poster of the 1975 romantic film that featured Sachin and Sarika in lead roles. Printed and circulated during the first release of the film (somewhere in the mid 1970s), this vintage Indian cinema poster was originally designed for publicity of the film but never ended up being used. This poster was originally designed on a hand drawn canvas by one of the most sought after Bollywood poster artists/painters, C. Mohan, making it highly collectible. The poster bears the tell-tale marks of C. Mohan’s flamboyance, with its picturesque orange red background and superbly drawn portraits of the lead actors. Artist C. Mohan’s original signature appears on the bottom left of the poster. The typography used in this poster is entirely in Devanagari Hindi, except for a translation of the title in English at the bottom. The lead actor is seen playing a flute in the foreground, serenading his lady love who appears in the background wearing a traditional red wedding saree. Musical waves and notes are seen traveling from the flute into the background, which is accentuated by a beautiful sunset. Spectacular hand painted Bollywood movie poster of the hit Hindi film, Geet Gaata Chal (1975) for sale. This is an actual surviving old Hindi film poster of the 1975 romantic Bollywood movie that featured Sachin and Sarika in lead roles. Printed and circulated during the first release of the film (somewhere in the mid 1970s), this vintage movie poster was originally designed for publicity of the film but never ended up being used. This vintage movie poster was originally designed on a hand painted canvas by one of the most sought after Bollywood poster artists/painters, C. Mohan, making it highly collectible. The poster bears the tell-tale marks of C. Mohan’s mastery, with its dramatic background and superbly painted characters. Artist C. Mohan’s original signature appears on the bottom left of the poster. The typography used in this poster is entirely in English, except a translation of the title in Devanagari Hindi at the bottom.